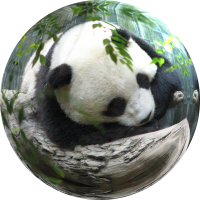 The giant panda, or panda, Ailuropoda melanoleuca, literally meaning "black and white cat-foot" is a bear native to central-western and south western China. In the wild, the giant panda is a terrestrial, solitary, animal and primarily spends its life roaming and feeding in the bamboo. Black and white giant panda bear sleeping coffee mug. Black and white giant panda bear sleeping travel mug. Panda bear munching on leaves.